It’s easy to overlook the many attempts by American industry to turn oil refining byproducts into lucrative space age man made fabrics. We all know of Dacron, nylon, terylene etc when appliedto clothing but what is less well known and less remembered are the attempts to replace one of nature’s most noble fabrics. Leather. 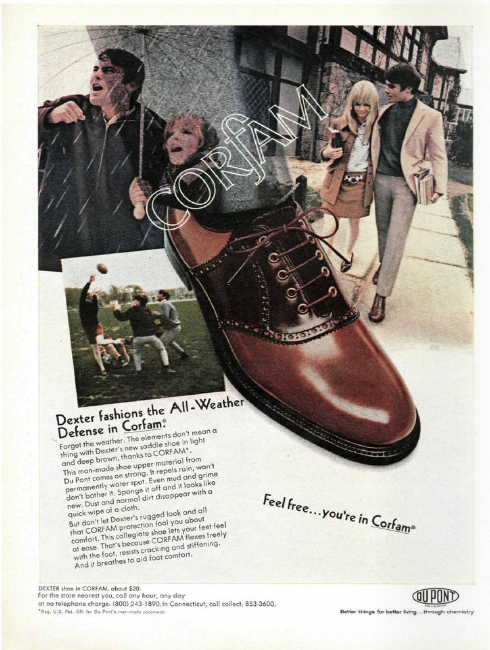 In the late 60s Dupont was heavily pushing Corfam, its answer to leather. Supposedly breathable and longer wearing with no need for regular polishing, this plastic leather was really like wrapping your feet in a couple of PET coca cola bottles and wandering through Death Valley. Not to mention the immense blisters caused by the unyielding plastic. How do I know? Well in about 1970 Ma Weejun insisted on buying me a pair of John White TUF monk strap shoes for school wear. The sales assistant assured her that these (great looking but stiff as a board) monsters would outlast the regular Clarks Commandos. The reality was horrendous although thankfully didn’t lead to lasting damage as a few short months later the shoes smelled so bad from infant foot meltdown that they were jettisoned in favour of the aforementioned Clarks. The fabric was usually hard and had like many early man made materials had a tendence to harden and crack over time. 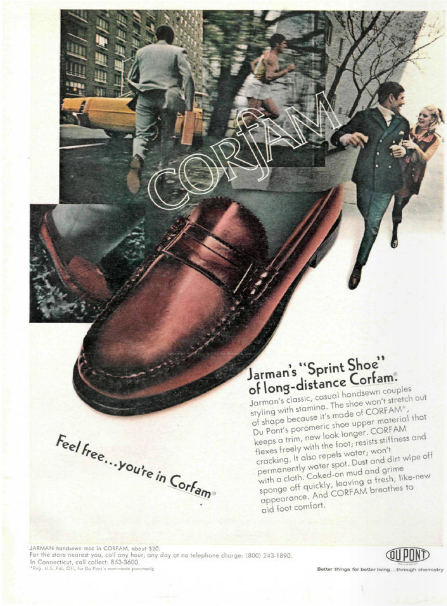 I doubt whether many of you have even seen such vintage Corfam shoes listed on Ebay either because most ebay sellers can’t tell plastic from leather (witness all those listings for Dexter Beefoll loafers that claim leather soles – Dexters rarely had them) or more likely because they rotted away and were thrown out decades ago. Dupont obviously had some pull and the names in their 1968 advertising campaign are classic Ivy makers. Those Weejuns look great don’t they? Just don’t try walking in them. Synthetics in Ivy… the dirty side of the natural shoulder story. It’s not all natural fibres is it Mr Weejun? My first Ivy shirt was a polycotton Sero from J.Simons circa 85. I loved it until the armpit area became rather encrusted and, well, plasticky. Sorry to put readers off their lunches. Never seen plastic loafers before, though I still reckon I’d prefer these to the current pseudo-echt Weejun. Synthetic and fake do not always mean the same thing. I know they still look great don’t they, but can you imagine how gutted you’d feel if you found a deadstock pair on ebay, misdescribed and they arrived in Corfam? Rock hard with 40 odd years of age. My first Sero was also a poly mix half sleeve sourced from a long forgotten vintage store in Bournemouth called Katz – chock full of deadstock and a pull for a bunch of us at school lunchtimes. The owners were two brothers who tolerated us fourteen year olds. At school we had to wear a light blue S/S shirt in summer, so why not a Sero OCBD I thought? The headmaster tried to enforce the rule of local school suppliers but I held out. There were no rules that said collars couldn’t have buttons, you see? Teenagers and polycotton though are not a good mix for the very reason you outlined in your comment! I just bought a pair of what I thought were vintage leather wingtips that turned out to be Corfam from a resale store. They weigh a ton and are like you said, pretty stiff for being 40+ years old. Going to take out the insoles and replace with the best gels I can find.